LEXINGTON, Ky. − A team of researchers led by University of Kentucky College of Agriculture Professor Joe Chappell is making a connection from prehistoric times to the present that could result in being able to genetically create a replacement for oil and coal shale deposits. This could have fundamental implications for the future of the earth’s energy supply. Tom Niehaus, completing his doctorate in the Chappell laboratory; Shigeru Okada, a sabbatical professor from the aquatic biosciences department at the University of Tokyo; Tim Devarenne, a UK graduate and now professor of biochemistry and biophysics at Texas AM University; and UK colleagues, Chappell, David Watt, professor of cellular and molecular biochemistry (College of Medicine) and his post-doctoral associate Vitaliy Sviripa had an important paper published today in the Proceedings of the National Academy of Sciences (PNAS). Their research findings go well beyond the basic science dealing with the origins of oil and coal. While scientists previously established that oil and coal have their roots in the organisms that lived on the planet over 500 million years ago, researchers only are sure of one organism that directly contributed to these natural resources. 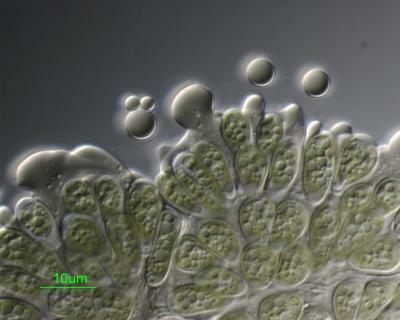 That organism is the algae Botryococcus braunii which left behind its chemical fingerprints – an oil that over geological time has turned into oil and coal shale deposits. “Even more exciting is that this unique algae, B. braunii, still exists today and has been the target of studies from the large chemical and petrochemical industries,” said Chappell. This algae is very slow growing, so it is not necessarily a good source for biofuels. However, if scientists can capture its genetic blueprints for the biosynthesis of these high value oils, then these genes could be used to generate alternative production platforms. This team of investigators isolated the necessary genes, characterized the biochemical traits encoded by these genes, and then genetically engineered yeast to produce this very high-value oil. This work has provided the first example of recreating a true direct replacement for oil and coal shale deposits.